For more of Natalie’s recipes, visit Perry’s Plate, “Like” her page on Facebook, and follow @perrysplate on Twitter. Hi guys! I’m Natalie, and I blog over at Perry’s Plate. To be honest, I wasn’t sure what to create for this shin-dig because . . .
I’ve never been to a cocktail party. It’s true. Please don’t laugh. My lack of cocktail party invitations is most likely due to the fact that I don’t drink alcohol. (Neither do most of my friends.) 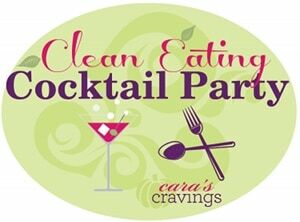 I’m pretty stoked that Cara’s Clean Eating Cocktail Party is my very first one! My husband, my three little girls (the biggest reason adult parties are lacking in our lives), and I are pretty clean eaters and veer toward the paleo/primal end of the spectrum (but not too strictly). We love our desserts, though, and take them very seriously. Birthday cake planning is talked about almost every single day. Because we save “real” desserts for special occasions, we have a few things in our arsenal to tide over our sweet teeth during the week. 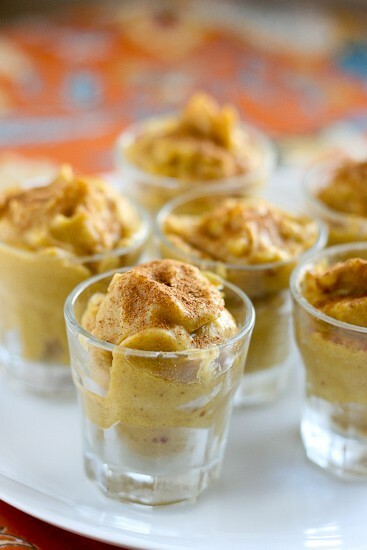 These Frosty Pumpkin Pie Shots are one of our favorites, and would also be a great addition to a fall party spread! We recently bought one of those rocket-fueled blenders. You know what I’m talking about, right? Well, there was a recipe for a chocolate frosty thing in the blender’s cookbook that we just LOVE. 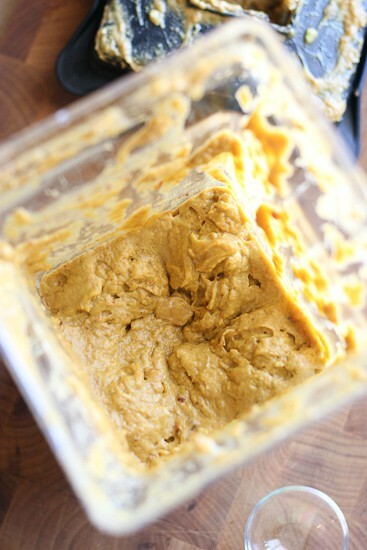 I tinkered with the recipe and came up with a pumpkin pie version! The ingredients are rather surprising, though. . . completely vegan and nut-free. Yes, that avocado is there on purpose. And yes, it actually does taste good blended together. It sure looks strange right now, though. Better? 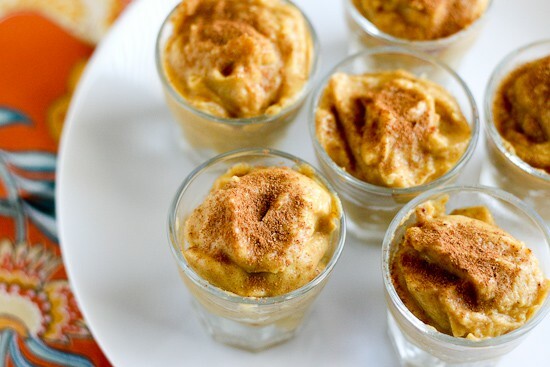 Now we have pumpkin-pie-ish pudding stuff. Dump a bunch of ice on top, give it another whirl, and . . .
there. Much, much better. The texture of this is slightly creamy, like a sherbet. If you want it creamier, you could always add a splash or two (or five) of heavy cream. Divide the frosty goodness into mini glasses, and dust with a bit of pumpkin pie spice if you want. Thanks again for having me, Cara! Thick and frosty pumpkin shake made with all natural, vegan and nut-free ingredients. Serve 'em up in shot glasses for a fun party treat! Add the ice, about 3 cups, or until the contents of the blender measures around 4 or 4 1/2 cups. Blend again (use the "ice cream" program on your Blendtec twice), pushing the ice down if necessary. Divide into glasses and serve immediately. 1. 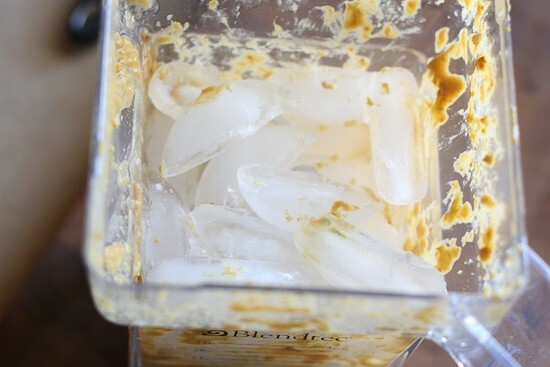 If you don't have a power blender like those mentioned above, make the base in your food processor, then transfer the contents to your blender before adding the ice. Add 1/2 cup of warm water to get things moving. The texture isn't quite as thick, but it really works nicely. 2. Unfortunately this isn't a make-ahead type of dessert. 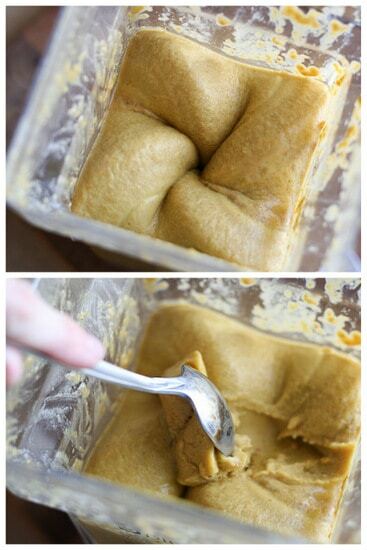 If you put it in the freezer for more than a few hours, it will become rock solid. 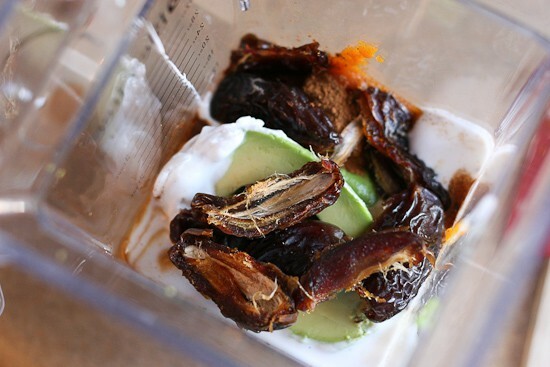 You can, however, make the base ahead of time, refrigerate, then blend it with the ice when you're ready to serve. this is my kind of recipe 🙂 looks incredible! Yummmm! You just helped me figure out my dessert for T-giving! Thank you!!!!! You’re rockin’ your blog and doing GREAT posts. So happy to see! And you look fantastic! For your first cocktail party, you done good! I have to admit, I’ve never been to one either even though I technically DO drink (but barely if we’re being honest…constantly marathon/half marathon training does not lend itself well to imbibing). These shots are the only kind I really care to do anyway! They look amazing! I agree with Natalie, we’ve had to tone down the spice, but otherwise our little person eats the same thing as us. Yummmy! These look so delicious and perfect for a party! I thought that was brisket in the second picture. Yup. Brisket… I have clearly been deprived too long. 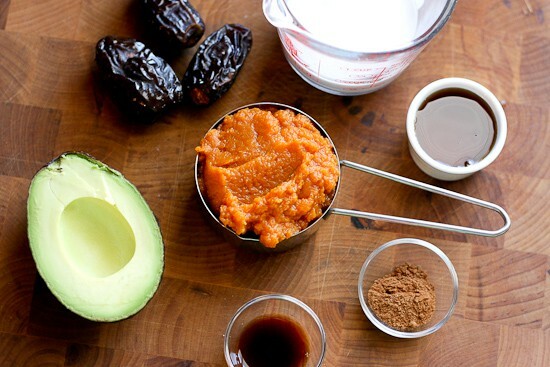 What can you use as a substitute for the avocado? I’m highly sensitive to avocado and bananas- other sugestions? If dairy is ok, how about just some cottage cheese or yogurt? The avocado makes it creamy, and either of those should do the same. PS I’m glad you told me this today!